My little man will be 19 months old on the 12th, and with his increasing independence comes a number of changes, both for him and for me. I’ve been practicing baby-led feeding and baby-led weaning, which means we’ve had fewer struggles than we might otherwise have had along our journey but it also means the weaning process is taking significantly longer than it otherwise might. That being said, my son took the lead on night weaning about four months ago, and I am happy to report that we are now officially done with the 2 a.m. (and 3 a.m. and 4 a.m.) feedings. In fact, we’re down to just two nursing sessions a day: one before nap and one before bed. Neither lasts longer than 15 minutes, and I’m hoping to drop both soon. While this is really good news for me (I can’t wait to have my body to myself again), it is also not so good news. Hormones change and fluctuate a lot during pregnancy and breastfeeding. They also change when we begin to wean, and again when we finally drop that final nursing session. For some women, this isn’t a super big deal. I’m not one of those women. As I shared on this blog, my migraines were terrible during the first half or more of my pregnancy. They eased up a little during the third trimester and were largely absent during those first few postpartum months. Then, they kicked in again, and as we’ve progressed through the postpartum period and into the toddler years, they’ve gotten worse. This is due in part to the hot and ever-changing Texas weather and in part to weaning. Weaning related migraines are nothing new. If you search the internet, you’ll find a large number of women discussing how much worse their migraines got when they stopped breastfeeding. Somehow, though, it was something I wasn’t entirely prepared to experience. Unfortunately my expectations had little to no effect on reality. I’ve started amitriptyline as a preventative. As of now, I’m only on 10 mg once a day, but I’m working myself up to 30 mg. We’ll reevaluate my progress when I go back for a follow-up at the end of the month. I’m still taking 400mg of Magnesium as a preventative as well. I also have Fioricet and Promethazine tablets and a nasal spray version of Toradol for use as rescues. I haven’t used most of these medications yet, as I try to avoid medications as much as possible. I have taken two of the Fioricet tablets, but so far I’ve experienced little relief. I’m hoping the amitriptyline will bring help. If it doesn’t, I believe we’re going to try a calcium channel blocker, which is one of the only preventatives I haven’t tried yet. If that doesn’t work, we’ll wait until my son has decided to completely give up nursing and then try a few other things. I trust that eventually either time or a medication will help. Migraine affects us all differently. While some migraineurs experience daily migraines, others get them once or twice a month or even once or twice a year. Some of us are completely disabled by each and every one of our attacks, others are able to “power through” some of their more essential tasks. But, we are all affected by migraine, in our way. This is something I feel we sometimes forget. It is also something I think is vitally important for us all to remember. Migraine is, as almost all invisible illnesses are, a profoundly isolating disease. It is also very frequently associated with depression, anxiety, PTSD, and domestic violence – all of which tend to make us feel even more alienated. The immense community available to us online is one of the main things that keeps most of us above water. Yet, like all communities, it has its shares of petty jealousies, competitiveness, and judgment. If we’re truly going to be the community I know we can be, we have to keep these facts in mind. When we lose sight of them, we fail not only each other but also ourselves. I recently read a fellow blogger’s post about her surprise at the backlash she experienced from some readers when she admitted to finally asking her doctor to sign papers so she could obtain a handicapped license plate. As a migraineur living in a state where temperatures routinely reach over 100 degrees at least six months out of the year, I totally understand her reasoning. I too have been confined to my house for months on end because it was too hot outside and the sun was too bright for me to walk across a parking lot without getting an instant, severe migraine attack. A front row parking space would really help maintain quality of life. I get it. But, not every reader did. Worse yet, some of those who didn’t agree decided to share their disagreement in the ugliest way possible: an attack. And, while many of us would never respond in such a manner, we still occasionally judge and condemn one another in various ways. I’m as much to blame as anyone else. I didn’t really feel that way, of course. Not most of me, anyway. The vast majority of my inner self, wanted him to take the time to recover. I also knew that, during my worst attacks, I too crawl into bed as soon as I am able to do so and try not to move. But, I still thought it. And, many of us think such things all the time. This is normal. In some ways, it may even be healthy. But, it absolutely goes against what we’re trying to do online, which is offer each other support, unconditionally. So, here’s my vow to you: I won’t judge you. No matter what you say on this website. No matter what decisions you make about your life, your health, and managing your disease. No matter how often or how rarely you experience an attack. Instead, I will hear you. I will support you. Unconditionally. Living with migraine disease isn’t only about dealing with pain, nausea, fatigue, and other physical symptoms. It’s also about handling the accompanying emotional and mental challenges. How to fight the fear, isolation, and anger that so often accompany the disease. I’m excited to finally have the opportunity to share the wisdom and insights I’ve gleaned from six years of chronic, often “intractable” migraine. I hope you find it worthwhile! The book is available on both Kindle and Nook, or as a PDF. 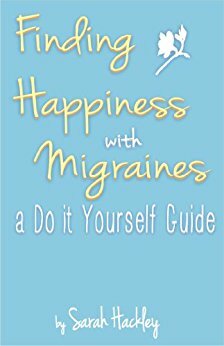 Find out more here: http://www.absolutelovepublishing.com/Happiness_with_Migraines.html. Migraine disease is largely invisible. Yes, my husband can (usually) tell if I’m getting one by the pained expression on my face and the irritable tone in my voice, but by and large it is an invisible illness. This means that most of the time I suffer from it – and through it – alone. Writing this blog helps. Before getting involved with the online chronic illness, invisible illness, and migraine communities, I often felt desperately and terrifyingly alone. No one I knew understood the intense and long-lasting agony I was experiencing every day, all day. Sure, I had a few friends who experienced occasional migraines, but even they were unsure how to relate to what was happening to me. By writing about my migraines, I gained access to the people who could (and did) understand. I get a lot out of writing this blog. I get to vent, and I get to be heard. But, most importantly I get to share with people who “get” me and what I’m going through. I gain comfort from my readers. And, I think (I hope) I offer comfort in return. It isn’t easy to handle being chronically ill. (In fact, I still find it difficult to even consider myself as a chronically ill person.) You all help me with that. Knowing we are not alone is perhaps the biggest gift we can give each other, and I thank you for giving that gift to me. Those of you out there who also are suffering with health issues, do you write about them? If so, why? This blog is not intended to be, and should not be construed as being, medical advice or a recommendation to take any medicinal drug, supplement, or other product. Readers should always seek a professional medical opinion in light of their own symptoms and circumstances. I am not trained in medicine, public health or patient education. I share my story here only in hopes that it comforts and encourages others. If you read something here you’d like to try, consult with your health care professional before making any changes to your treatment plan.